Objective To provide insight into how and in what clinical fields overdiagnosis is studied and give directions for further applied and methodological research. Data sources Medline up to August 2017. Study selection All English studies on humans, in which overdiagnosis was discussed as a dominant theme. Data extraction Studies were assessed on clinical field, study aim (ie, methodological or non-methodological), article type (eg, primary study, review), the type and role of diagnostic test(s) studied and the context in which these studies discussed overdiagnosis. Results From 4896 studies, 1851 were included for analysis. Half of all studies on overdiagnosis were performed in the field of oncology (50%). Other prevalent clinical fields included mental disorders, infectious diseases and cardiovascular diseases accounting for 9%, 8% and 6% of studies, respectively. Overdiagnosis was addressed from a methodological perspective in 20% of studies. Primary studies were the most common article type (58%). The type of diagnostic tests most commonly studied were imaging tests (32%), although these were predominantly seen in oncology and cardiovascular disease (84%). Diagnostic tests were studied in a screening setting in 43% of all studies, but as high as 75% of all oncological studies. The context in which studies addressed overdiagnosis related most frequently to its estimation, accounting for 53%. Methodology on overdiagnosis estimation and definition provided a source for extensive discussion. Other contexts of discussion included definition of disease, overdiagnosis communication, trends in increasing disease prevalence, drivers and consequences of overdiagnosis, incidental findings and genomics. Conclusions Overdiagnosis is discussed across virtually all clinical fields and in different contexts. The variability in characteristics between studies and lack of consensus on overdiagnosis definition indicate the need for a uniform typology to improve coherence and comparability of studies on overdiagnosis. First complete overview of overdiagnosis across medical disciplines. Identification of the dominant clinical fields in which overdiagnosis is being studied, what characteristics these papers have and in what context it is being studied. Not a fully comprehensive systematic review, due to widespread variation in terminology and concepts used related to overdiagnosis. Studies on incidental findings were likely missed due to usage of different terminology to describe overdiagnosis. Overmedicalisation is the broad overarching term describing the use of ‘too much medicine’.1 It encompasses various concepts such as disease mongering, misdiagnosis, overutilisation, overdetection and overtreatment. Initiatives relating to these concepts have begun to flourish on a global scale under the ‘Choosing Wisely’ initiative and in national programme such as Slow Medicine (Italy, the Netherlands and Brazil), Quaternary Prevention (Belgium) and Do not do (UK).2 3 A subcategory of the aforementioned concepts is overdiagnosis. This has become an even more popular term especially over the last two decades.4–9 Furthermore, an annual conference going by the name of ‘Preventing Overdiagnosis’, dedicated to issues surrounding this concept, has been gaining popularity ever since its start in 2013, demonstrating a growing interest in the topic.10 In this scoping review, we will focus specifically on overdiagnosis. Consequences of overdiagnosis may be serious and can be subdivided in negative effects on patient health and additional costs within the healthcare system.21 Health effects include impaired quality of life and early loss of life due to side effects or complications of unnecessary subsequent testing or treatment. Incorrectly labelling of individuals as patients may also lead to stigmatisation, impacting psychological well-being and indirectly exert social effects through eligibility for health benefits. In monetary terms, overdiagnosis can result in unwarranted usage of (follow-up) tests, treatment and healthcare facilities and services. Despite the increasing number of publications on overdiagnosis, ranging from discussions on overdiagnosis definition to estimating its impact, a scoping analysis on overdiagnosis is still lacking. In the present study, we provide an overview of research that has been performed across medical disciplines surrounding the topic of overdiagnosis. We will give insight into how and in what clinical fields overdiagnosis is studied and provide directions for further applied and methodological research to investigate the mechanisms and impact of overdiagnosis and to generate directions for reducing or preventing overdiagnosis. 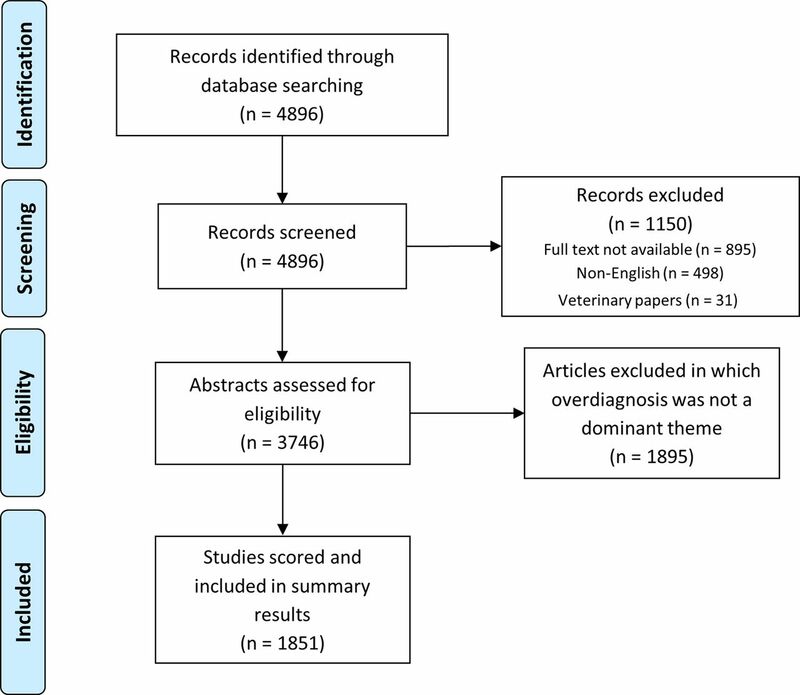 PubMed was searched on August 2017 for published articles using keywords related to overdiagnosis, overdetection, overscreening, insignificant disease, overtesting, overmedicalisation, pseudodisease, inconsequential disease and quaternary prevention by using the following query: overdiagnos*[tw] OR over diagnos*[tw] OR overdetect*[tw] OR over detect*[tw] OR ‘insignificant disease’[tw] OR overscreen*[tw] OR over screen*[tw] OR overtest*[tw] OR over test*[tw] OR overmedical*[tw] OR over medical*[tw] OR ‘pseudodisease’[tw] OR ‘pseudo disease’[tw] OR ‘inconsequential disease’[tw] OR ‘Quaternary prevention’[tw]. These terms were chosen as they were believed to capture most concepts related to overdiagnosis, generating a representative set of articles. All English articles on humans where full text was available were included. Articles in which overdiagnosis was a dominant theme were included. Overdiagnosis was considered a dominant theme when a paper clearly addressed overdiagnosis as an issue being investigated or discussed. For example, a study on the adoption of a new threshold guideline for prostate-specific antigen screening for prostate cancer was considered to have a dominant overdiagnosis theme. In contrast, a study that used overdiagnosis as a buzzword and merely suggested in the discussion that overdiagnosis might possibly play a role or have occurred, was excluded. Studies with overdiagnosis as a dominant theme were included regardless of which definition of overdiagnosis the authors adopted. The titles and abstracts of the included studies were then screened. Included studies were assessed using (a list of) prespecified criteria. These criteria were established by screening the first 200 studies of the search query. They included clinical field, study aim, article type, type of diagnostic test, whether this was a screening test and the context in which overdiagnosis was discussed. These criteria are described below (see further details in the online supplementary file 1). Articles were assessed based solely on title and abstract. If an abstract was unavailable (eg, opinion pieces), the full text was scanned. The clinical field to which the study belonged was determined using the ICD-10 classification. When a study addressed more than one clinical field or did not address overdiagnosis within a specific clinical field, but discussed overdiagnosis on a more general level, they were included in the separate category ‘no specific clinical field’. Two study aims were distinguished: (1) studies focusing on how overdiagnosis should be studied. These are studies with a methodological aim. Examples are studies looking into how overdiagnosis estimations are affected by the methods used, or studies providing a framework for the definition of overdiagnosis. Simulation studies using mathematical models for estimating the extent of overdiagnosis were also classified as methodological studies. Studies not addressing the aforementioned concepts, but rather provide, for example, a qualitative overview of the (possible) impact of overdiagnosis in a certain field, or calculate overdiagnosis estimates from empirical data, were considered to have (2) a non-methodological aim. Studies were classified using four article types: primary studies, narrative reviews, systematic reviews or commentaries. Primary studies used data collected from trials, observational studies or generated using simulation models. Narrative reviews described a broad oversight on overdiagnosis. These included editorials, opinion pieces, interviews and overviews. Systematic reviews stated a specific hypothesis and tested this using a systematic approach to gather existing literature. If a systematic approach was lacking, these studies were scored as narrative reviews. Studies were considered commentaries when they, replied to previously published papers. Diagnostic tests were categorised into six types: imaging, medical examination, biomarker, histology, prediction model or various. Whenever a study looked into a combination of two tests, both types were scored. For example, an image-guided biopsy would be scored as both an imaging and histologic diagnostic test. If three or more diagnostic tests were addressed within a study, or overdiagnosis was addressed in a general context without any diagnostic test in particular, this was scored under ‘various tests’. When studies focused on a test used for screening groups of asymptomatic individuals, this was scored as a screening study. Studies that did not explicitly state that the diagnostic test was studied in the context of screening, were scored as a non-screening. To assess the context in which studies discussed overdiagnosis five categories were defined: estimating extent of overdiagnosis, disease definition, overdiagnosis communication, incidental findings and genomics. The first category, estimating extent of overdiagnosis, relates to all articles giving a quantified estimate of overdiagnosis. Disease definition revolves around the setting of thresholds to define the absence or presence of a disease or to distinguish between two subcategories of a certain disease (eg, progressive and non-progressive forms). Overdiagnosis communication relates to studies aimed at assessing and improving the understanding of overdiagnosis in the general public and improving overdiagnosis dissemination by the healthcare professionals. Studies addressing abnormalities found of an unrelated condition during either diagnostic testing or surgery were scored as studies on incidental findings. Spurious findings on genome wide screening tests were scored in the overdiagnosis context of genomics. The PubMed search resulted in a total number of 4896 studies identified. After application of the inclusion criteria, 3746 studies were assessed for eligibility on title and abstract. Studies in which overdiagnosis was a dominant theme yielded 1851 studies (figure 1). Table 1 provides a summarised view of the characteristics of the total number of studies, the four largest clinical fields, all other remaining clinical fields and studies not related to a specific clinical field. Flow diagram of article selection for further review and scoring. Studies addressing methodological issues consisted of 20%. The majority of these studies were performed within the field of oncology. However, non-methodological studies were the most common study aim used across all clinical fields, accounting for 80% of the total number of articles. These notably included studies using empirical data to assess the occurrence or estimate overdiagnosis for a specific disease. Primary studies (58%) were the most common article type discussing overdiagnosis. Of all included studies narrative, systematic reviews and commentaries represented 24%, 9% and 9%, respectively. From all studies that addressed a specific clinical field, the proportion of systematic reviews and commentaries was relatively high within oncology. Imaging was the most often encountered diagnostic test, accounting for 32% of all studies. Biomarkers (15%), histology (13%) and medical examination (17%) were approximately equally often found. Prediction models were less common (3%). The proportion not related to one particular diagnostic test of interest was 21%. Distributions of diagnostic tests varied significantly depending on the clinical field. Imaging was most prevalent in oncology where it accounted for 48% of diagnostic tests, mostly related to breast (53%) and lung cancer screening (21%). Within the field of mental disorders medical examination was often seen in the form of application of the Diagnostic and Statistical Manual of Mental Disorders (DSM) as diagnostic tool. Biomarkers and histology were seen relatively more frequent as diagnostic tests for infectious diseases when compared with other clinical fields. Diagnostic testing was studied in the context of screening in 43% of studies. There was, however, a skewed distribution between clinical fields. Within oncology, 75% of all studies were related to screening, whereas for mental disorders, infectious diseases and cardiovascular diseases, this was 15% or lower. The context in which overdiagnosis was most frequently discussed related to its estimation (53%). Only within the field of mental disorders was disease definition more frequently discussed than overdiagnosis estimation (46% vs 22%). Descriptions and example studies on each of the five predefined categories can be found in table 2. The majority of studies discussing overdiagnosis (72%) were classifiable in one of these categories. Studies that did not fall within any of the five categories were scored in a separate ‘other’ category (28%). Results for each of these overdiagnosis contexts are discussed below. The most common context of discussion relates to overdiagnosis estimation, accounting for 53% of all studies. These articles could be divided into two groups. The first were studies attempting to estimate the degree of overdiagnosis in their respective clinical fields (79%). These often described the impact of a threshold shift or implementation of a diagnostic or screening intervention on the rate of overdiagnosis. Notable examples of this are prostate-specific antigen testing for prostate cancer and mammography for breast cancer.28–33 However, several articles estimated overdiagnosis in symptomatic conditions, such as incorrect diagnosis by untrained clinicians in patients presenting with malaria-like symptoms, leading to false-positives and unnecessary treatment.26 27 This should rather be considered misdiagnosis (incorrect diagnosis of a symptomatic person with a condition they do not have1) due to inaccuracy of clinical tests used in practice leading to false-positives, incorrect disease labels and overtreatment. The second group represented studies that report methodological approaches for how one should estimate overdiagnosis (21%). Differences regarding definitions used, measurement, study design and methods for estimation can lead to different results,34 hence there is often a large spread in these estimates, resulting in controversy regarding the true impact of overdiagnosis in the field. This scoping review provides insight in the current landscape of overdiagnosis. There is great diversity in study characteristics across medical disciplines and in the contexts in which overdiagnosis is discussed. Some characteristics correlate with specific clinical fields, with, for example, screening occurring predominantly in oncological studies and medical examination being the most prevalently used diagnostic test for mental disorders. Overdiagnosis is discussed in a variety of contexts; however, three could be distinguished which invoked significant debate: (1) differences in overdiagnosis definition, (2) differences in methods used, leading to varying overdiagnosis estimates and (3) typologies for overdiagnosis. The definition of overdiagnosis has been topic of discussion for some time. In a narrow sense, it refers to a diagnosis that does not result in a net benefit for an individual.1 This can be viewed within an individual or on a group level, where benefits (early detection of clinically relevant disease) are weighted against the deficits (overdiagnosis and its associated consequences). However, not all included studies give a clear definition, but implicitly use the definition of overdiagnosis as a diagnosis of a ‘disease’ in an asymptomatic individual, that will never go on to cause symptoms or early death.7 This definition is particular to the screening context, but does not apply to a large portion of the studies found in this review that are on testing symptomatic individuals, for example, those with mental disorders. Others have used the relation between pathology and symptoms as a measure of overdiagnosis.52 53 In the latter, there is no doubt that there is a clear abnormality; however, it is uncertain whether smaller forms of this abnormality still significantly correlate with future clinically relevant disease. Ultimately, the question would be how or even if we should treat these individuals. These examples of definitions demonstrate the heterogeneity and complexity of the concept of overdiagnosis and have led to the discussion regarding the extent or even the existence of overdiagnosis. Which definition researchers use for overdiagnosis needs to be reported completely to be able to judge the applicability of the results. Several studies have provided overviews and acknowledged that finding a singular definition of overdiagnosis may not be feasible. However, providing an overdiagnosis classification, aimed at describing subtypes of overdiagnosis, could prove to be useful. Some efforts have been made to create such a typology, however this is challenging as definitions vary widely and classifications can be made over different axes. Hence, this is a complex issue which should be addressed in a systematic manner. A comprehensive typology could aid researchers in their communication as was already suggested in a paper by Moynihan et al.6 A recent paper by Rogers described the use of maldetection (issues with our understanding of what ‘truly’ disease is) and misclassification (an implicit or explicit threshold shift resulting in overdiagnosis).13 Shortly after this publication, Carter et al described the concepts of predatory, tragic and misdirected overdiagnosis.17 Other work by Hofmann takes a more sociological and philosophical point of view. In his 2017 publication, indicative, measurable and observable phenomena are used to describe the different stages in which a phenomenon develops into a clinical manifestation.16 In oncology, a tumour-patient classification has been described, relating to tumours that are regressive, non-progressive or truly malignant disease.65 Although these works provide great improvement in our understanding of the issues at hand, they do not give further guidance as to how these concepts should be used in clinical research. To our knowledge, this is the first scoping review performed on the subject of overdiagnosis. It provides broad insight in the available research on specific topics within overdiagnosis. To appreciate the findings in this review, the following limitations should be considered. First, studies were excluded when they did not have full text available. This may have led to exclusion of a selection of relevant articles, but not a systematic exclusion of a particular range of overdiagnosis studies. The same holds true for the lack of search criteria for iatrogenic disease, overtreatment and overutilisation. The issue in identifying studies discussing overdiagnosis, is that there are no clear selection criteria to find these. Terminologies used to describe overdiagnosis differ between studies, are widely spread and search filters in medical databases are lacking. Hence, our goal was not to perform a comprehensive search. Instead, we aimed at finding a large representative of papers discussing overdiagnosis. Second, unexpectedly, studies on genomics and incidental findings (or incidentalomas) were largely missed. Forward reference checking revealed that some of the papers not found in our search may use other terminology for describing overdiagnosis, such as the ‘prevalence of significant findings’ or ‘diagnostic value’. Using our search strategy, these articles were unfortunately omitted and not included in this review. When researchers are interested particularly in this subset, the information in this review might not suffice. In summary, overdiagnosis is a topic discussed over medical disciplines, and in a wide array of contexts, from conceptual ideas in definition to practical issues for clinicians in daily practice. The various characteristics of studies looking at overdiagnosis suggest that there may be different (and sometimes multiple) underlying mechanisms through which it may manifest itself. A lack of consensus on what is called overdiagnosis hampers communication between researchers, physicians, patients and policy-makers. The use of overdiagnosis to describe misdiagnosis will dilute its actual meaning, result in linguistic confusion and counterproductive discussion, and should thus be avoided. Providing clarity on the mechanisms that lead to overdiagnosis will aid researchers communicate their results, especially with regard to overdiagnosis estimates. Future methodological studies should focus on establishing a framework to aid clinicians and researchers in understanding the different subtypes of overdiagnosis, their consequences, and provide guidance for selecting appropriate study designs and methods that match the research question of interest. ABIM foundation. Choosing wisely around the world. 2015. http://www.choosingwisely.org/resources/updates-from-the-field/choosing-wisely-around-the-world/ (accessed 4 Jan 2017).
. Less is more medicine. http://www.lessismoremedicine.com/projects/ (accessed 9 May 2017).
. Overdiagnosed: Making People Sick in the Pursuit of Health, 2010. Preventing Overdiagnosis. Preventing overdiagnosis conference. http://www.preventingoverdiagnosis.net/ (accessed 4 Jan 2014).
. Is the problem that everything is a diagnosis? Aust Fam Physician 2013;42:856–9.
. Screening for coronary artery disease in assymptomatic adults is not recommended, so why is it still done? Rev Port Cardiol 2004;23:1633–8. Contributors KJ, JAHdG and CAN have contributed to the conception and design of the study. KJ, JAHdG and CAN have contributed to the establishment of search and scoring criteria. Article reviewing, scoring and data analysis has been performed by KJ. KJ, JAHdG, JBR, KGMM, LH and CAN have made contributions to the drafting and revising of the article. KJ, JAHdG, JBR, KGMM, LH and CAN have approved the final version to be published and its accuracy and integrity. Funding Netherlands Organization for Scientific Research (project 918.10.615). Data sharing statement Readers interested in using our database on overdiagnosis for specific purposes related to their respective research are invited to do so by contacting the first author through the corresponding email address.